This is an overview of my training plan for RAW 2019. Its been developed based on an amalgam of my 33 years of training and bike racing combined with what I have learned working with three different professional coaches over 12 of those years. Of course, my thoughts and perspective have also been shaped and supplemented by what I have learned from my friends, fellow competitors, and compiled from what I've read over the years. The winter endurance blocks include a midweek 4-5 h ride and back-to-back 6-10 hour weekend rides. This is intended to make riding >130 miles and 7 h the "new normal", physically, mentally, and nutritionally. Use the group rides to add enough quality into the training to maintain a high end, focusing on 8-15 min hard efforts with the team. Race some key local events, including Oracle Road Race, Valley of the Sun Stage Race, and the Colossal Cave Road Race to stay fresh and fast. The February racing block will give a welcome break from weekend long rides and keep me fresh. The final endurance blocks introduce 3-day long ride blocks, with all three rides 100-130+ miles. Tour of the Gila adds a final refresh of the climbing, altitude, and intensity. 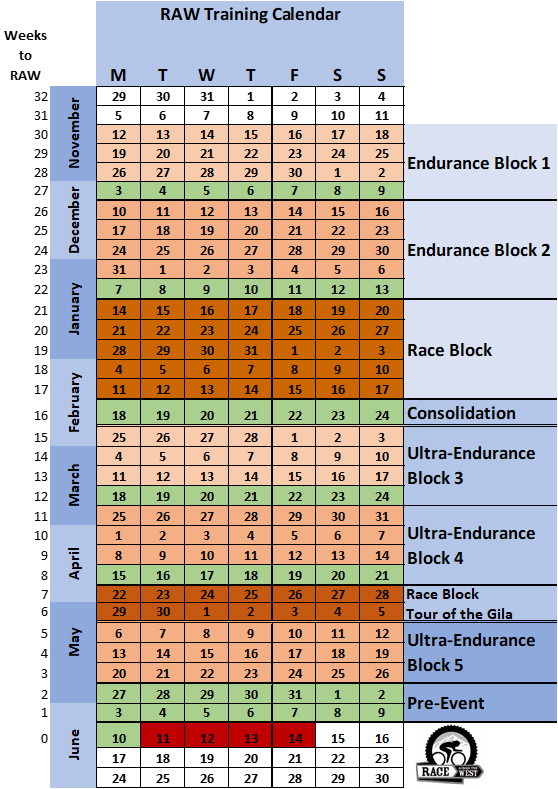 An overview of the training plan and its five macro-blocks of endurance and two racing blocks to sharpen. For RAW, the challenge is figuring out what of my experiences and knowledge are relevant to a three-day non-stop race, what can be adapted, and what must be learned anew. Physical, mental, and nutritional training are all required. Each is a critical component. Much of my thinking is derived from my stage racing, Hoodoo 300 and Dirty Kanza experiences. I've given a lot of consideration to differences in intensity, duration, and recovery embedded in those events and RAW. My "multiple-century" approach is similar to what Keith Wolcott documented in One Million Pedal Strokes. I've extended it so that I am comfortable with 130-150 mile (210-240 km) efforts. This overall approach worked well for me at Hoodoo. The workouts are as much about getting my mind as ready as my body for the duration of the event. The nutritional training is intended to adapt my energy systems to be optimized for continuous operation, versus the repetitive higher intensity bouts of performance traditional stage racing. In RAW, performance and recovery become one combined, continuous activity and the training and racing approach must be adjusted accordingly. The plan is organized into three macro-blocks. An initial endurance/race macro-block builds initial endurance, polishes it off with the racing, and consolidates these gains. 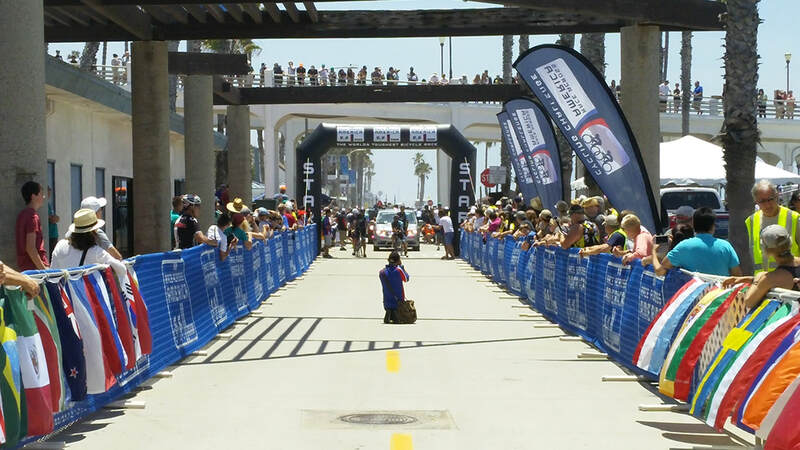 The second macro-block, "ultra-endurance", is the RAW specific endurance phase, introducing 3-day weekend blocks containing over 20 h of riding, and polishing it off with the Tour of the Gila. The last macro-block is brief, and is the final preparation before RAW. In each of the first two macro-blocks are two blocks of endurance, each four to five weeks in duration. Each block climaxes in a "consolidation" week. I prefer to think of this period as consolidating earlier gains of mental and physical fitness, nutritional adaptations, and body composition that are earned but not yet fully incorporated. I hope people find the plan and the approach interesting, and give feedback and offer their thoughts. Developing a training plan is a lot like academic research--learn what others have done, add your own knowledge and perspective, expand and adapted it for yourself, and put it out there for critical peer review. I also think it is important to document the plan as a artifact for others to review, and learn from. I know my first reaction is "wow, that's a lot of miles!" Indeed, but I have also learned that an effective plan must be a stretch. If a training plan could be executed with 100% compliance to the prescribed training, it was not enough of a stretch to have the desired result. Invariably, realities will get in the way of perfect execution, be it work, weather, family, injury, or illness. Plans may be adjusted based on how it goes, cutting back or extending as my body tells me I should. Much of my training is incorporated around my 1:15 bike commute to work, which recovers almost 2.5 h into my day to train. Nonetheless, sometimes work responsibilities also require some compromise and replanning. Build endurance base with back-to-back weekend rides approaching 7 h in duration. Build mid-week endurance ride to 4 h.
Maintain some quality tempo level work once a week, embedded with weekend group rides. Build on-bike nutritional intake tolerance and habits to 400 cal/hr on long rides with 40% fat/50% carbohydrate. Increase protein intake to > 1.5 g/Kg. Manage weight down to 141 lbs (64 kg) . Target of 138-139 (63 kg) for January-February racing season. [12/3/2018]: The first three weeks of the training block went better than expected. The start was 11 weeks after Hoodoo 300, and I had already started to do > 5 h rides again in the last month. The progression to 7 h felt straight forward, as was the transition to double long rides over the last two weeks. The challenge getting through the last Sunday ride was about the level of fatigue I was expecting going into the consolidation week. Getting through three consecutive weeks with 7 h rides, and that final 5 h ride on the last double weekend was very confidence building. The habit of feeding > 400 cal/hr on the bike is still a work-in-progress, but there is progress there. Continue to build endurance base with back-to-back weekend rides with longer ride approaching 8-10 h in duration. Build mid-week endurance ride to 5 h.
Maintain some quality tempo level work once a week, embedded with midweek ride. Build on-bike nutritional intake tolerance and habits to 400-500 cal/hr on long rides with 40% fat/50% carbohydrate. Maintain protein intake to > 1.5 g/Kg. Manage weight down to 138-139 (63 kg) for January-February racing season. The RAW race day target is a bit heavier 141-142 lbs (64 kg) for RAW, mostly to insure I am not glycogen depleted or dehydrated at the start. Race and have some fun. Get a break for the weekend on the bike. Use the racing to reintroduce the legs to hard efforts. Race aggressively and think of them as training races. Race open Cat 2 when possible. Supplement weekend with post-race ride to bring total time up to 5-6 h.
Specific 3-day long ride blocks with total time > 20 h and individual rides approaching 10 h.
Practice leap-frog support, communications, and brief service stops. Mid-week 2-3 day block becomes active recovery without concern for total duration. Maintain some quality tempo level work once a week. Specific 3-day long ride blocks with total time > 22 h and individual rides approaching 11 h.
Maintain weight despite huge training volume with good nutritional food and maintain 400-500 cal/h on the bike on long rides. Race Tour of the Gila, Masters A (40+). Refresh training with quality, climbing, and altitude. Maintain weight despite huge training volume with good nutritional food. Refresh and maintain ultra-endurance base with 5-8 h rides ad libitum depending on freshness and recovery from previous blocks and Tour of the Gila. Finishing long rides fresh and making them a confidence building experience more important than hours on the bike. Maintain heat acclimatization with rides in the heat (rather unavoidable given the duration and time of year in Tucson). Get experience with cooling vest on supported rides. Mount up aerobars on primary RAW bike and train with them. Maintain weight despite huge training volume with good nutritional food and maintain 400-500 cal/h on the bike on long rides. Allow weight to creep back up to goal RAW weight of 141-142 lbs (64 kg)​. Training ad libitum, single long rides if fresh. Finishing long rides fresh and with a confidence building experience more important than hours on the bike. Maintain 400-500 cal/h feeding on the bike on long rides. Riding ad libitum. Arrive at RAW fresh, motivated, healthy and confident. Early week long ride > 5 h if fresh. Focus on early preparation of food, supplies, reviewing crew plans, route, and race procedures and rules. Stay relaxed in Oceanside, let the crew take care of me and the preparations.